Radiology Department - Managed by Mahajan Imaging Center. All the infectious diseases are tested in our blood bank with the State of The Art Fully Automated System Vitros ECi from M/s Ortho Clinical Diagnostics based upon Enhanced Chemiluminescence Technology. Your blood is processed into Blood Components on Optipress II from M/s Baxter Inc., USA. This system is used to prepare Leucoreduced Blood products so that there is minimal chance of allergic reactions to the patients receiving the blood transfusion. Blood is separated into three Components i.e., Red Blood Cells Concentrate, Platelet Concentrate and Plasma. Different patients get different Blood Components according to their specific requirements. This optimizes the use of blood and also effectively benefits the patients. The donor's blood is cross-matched with the patient's blood sample by state-of-the-art Column Agglutination Technology (Glass Bead Technology) from M/s Ortho Clinical Diagnostics and Gel Technology from M/s Grifols, which ensures the safest blood transfusion. With the advent of Cell Separators (Amicus from M/s Baxter Inc USA), we can draw a particular component from the donor directly and rest of the constituents goes back to the donor. Such a facility exists in our Blood Bank. Through this latest Technology you can donate your platelets or plasma every 48 hours (24 times in a year). After blood donation every voluntary blood donor gets his blood report. Fortis Healthcare' Flt. Lt. Rajan Dhall Hospital has one of the most comprehensive Emergency services. The Emergency facilities include a 24x7 Emergency bay equipped with life-saving devices. The hospital is also equipped with high-end Cardiac ambulances for speedy evacuation. SRL Ranbaxy - India's Largest Pathology Laboratory Network, manages the Pathology Laboratory at Fortis Healthcare flt. Lt. Rajan Dhall Hospital. The hospital's in house laboratory has an extensive test menu meant to cater to the hospital's vast range of super specialities. The laboratory attempts to provide under one roof, a range of tests, numbering over 3000, based on 95 technologies, covering most diseases known to man. The tests menu includes Clinical and Special Chemistry, Haematology, Blood Coagulation Studies, Microbiology, Infectious Disease Serology, Autoimmune Disorders, Endocrinology, Surgical Pathology, Cytology, Oncology, Molecular Diagnostics, Cytogenesis, Immuno-histochemistry (IHC), Radioimmunoassays, Chemiluminescence and Polymerase Chain Reaction. The in-house laboratory is manned 24hrs by a dedicated team comprising of 3 doctors as well as trained scientific and support staff. The laboratory fully complies with the company's belief in quality assurance and accreditation. Each test offered in the menu has passed through extensive validation protocols carried out for the instrument as well as reagents. 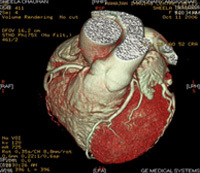 Amazingly accurate 3 - D imaging from a beating heart. The state- of the art 64 slice achieve true volumetric, 3- dimensional scanning of the heart in only 5 heartbeats-providing, almost instantaneously, unprecedented image quality. 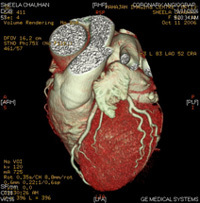 The high-resolution imaging allows early detection of even slight narrowings in the heart vessels. With this advanced machine, every routine CT scan is a 3 - D image. It takes only 5 second and one breath hold for the whole scan. Get a triple heart 'rule out'. The 64- Slice VCT heart scan at Fortis Healthcare provides, in a single rotation, high quality imaging that allows your doctor to examine for the three critical causes of serious heart condition such as : Coronary Artery Disease, Pulmonary Embolism and Aortic Dissection . The speed and accuracy enables a quick and reassuring clearance, or treatment prescribed speedily that can often be life-saving. Angiography the non-invasive way with the world's fastest CT scanning. Patient to come with prior appointment. Patients above the age of the 50 yrs are recommended to have BUN and serum creatinine checked. To take 50 mg of Beta-blocker after consultation with cardiologist /radiologist to reduce the heart rate at the time of scan. Patients having known allergies to contrast media/ other drugs should inform the radiologist before the scan. What is CT coronary angiogram ? A simple non invasive method to evaluate the status of the coronary vessels that supply the heart by ultra fast 64 slice per rotation Multislice CT scanner. The state of the art 64 -Slice achieves a true volumetric, 3-dimensional scanning of the heart in only 5 heartbeats- providing, almost instantaneously, unprecedented image quality. Pulse, BP is evaluated and oral metaprolol (50 mg or 100 mg) is given 1hour prior to the time of appointment. It the heart rate does not fall below 65, an additional oral dose of 25 mg to 50 mg is given and provided his BP is not compromised. Optimal heart rate is around 65 bpm. Scan can be performed on higher heart rate only if it is regular and there is no beat- to beat variation. How is CT coronary angiogram done ? The patient is put comfortable on a CT scanner table and a baseline calcium score is calculated in a few seconds. Following this contrast is injected in one of the peripheral veins with online ECG monitoring .The images required for a CT coronary angiogram are obtained in one single breath hold within 5 second. Subsequently processed, peformatted, analyzed and evaluated on a workstation. The inferences proved the radiologist an accurate picture of the heart and the coronary vessels that supply it. They are evaluated for narrowing, blockage, presence of different varieties of plaque (stable/ unstable). The status of the various chambers of the heart, cardiac muscles, and the main vessels carrying to and from the heart can also be easily seen. It is an excellent investigation to evaluate post-operative grafts , stents, and to exclude non-cardiac causes of chest pain. Who should undergo a CT coronary angiography ? Those who have cardiac risk factors such as high blood pressure ,diabetes and smoking. Those with suspected heart disease, due to abnormality in non -invasive testing such as TMT. Those who have undergone by-pass surgery and require a post -operative evaluation of their heart condition. Patient having a strong family history of heart disease, diabetics, heavy smokers, high blood obesity, high cholesterol/ triglycerides, alcoholics and those in high stress and tension jobs. The biggest recent technological leap in imaging and arguably, the most phenomenal preventive heart check is now close by, in the department of radiology & imaging, at Fortis Healthcare fl. Lt. Rajan Dhall Hospital. It comes with the most reassuring news for those who are apprehensive about undergoing conventional Angiography. At Fortis Healthcare, all the latest imaging facilities are available with state of the art technology, patient care and professional expertise. DR. HARSH MAHAJAN MD, Padma Shri, Honorary Radiologist to the President of India is the Director of the imaging department. The Nuclear Medicine Department is a state-of-the-art facility, equipped with the Millennium - MG dual head variable geometry all digital SPECT gamma camera from GE Medical Systems. One of the best gamma cameras available today, the Millennium - MG, is designed to meet the clinical requirements of the future as effortlessly as it meets those of today. This provides quick examination with least patient discomfort. The forte of Nuclear Medicine has always been the ability to give accurate information about the functional status of an organ. The advanced technology of the Millennium - MG system combines this information with excellent anatomical delineation giving the physician a total picture about the structural and functional aspects of a disease. Whether it is Cardiac imaging for ischemic heart diseases or high-resolution SPECT brain imaging for diseases such as Alzheimers and parkinsonism or scanning for cancer or infections, the information provided gives invaluable help and direction to the treating doctors. In addition to diagnostic imaging the centre is also involved in radioactive therapy for diseases such as thyrotoxicosis and painful bony secondaries on an out-patient basis. Equipped with the most modern equipment and dedicated staff, the Nuclear medicine Department of Fortis Healthcare, Flt.Lt. Rajan Dhall Hospital is arguably one of the best and most comprehensive Nuclear Medicine Centres in the country today. Taking full advantage of the most advanced technologies available, it is poised to be at the forefront of medical imaging and diagnostic services in the new millenium. Before your scan, you should tell your physician if you are pregnant or nursing. You can consume 1 cup of tea/ coffee with 2 biscuits/toasts at 7 a.m. & then remain fasting (No restriction for water). Calcium Channel Blockers for 72 hrs. Beta Blockers for 48 hrs. This scan is done to estimate the amount of blood reaching the heart muscles during rest and exercise. It is typically done for people with unexplained chest pain or to determine the location and amount of injured heart muscle after a heart attack. This scan is done in two parts, STRESS and REST . Total time required is about 5 to 6 hours depending upon the clearance of the injected radio- tracer from the liver. This test studies the functioning status of your kidneys. Before you attend for your appointment please drink plenty of fluids. There is no need to hold the urine. Duration : - 30 minutes. If your kidneys are slow to empty, we may wish to take another image later in the day or till 24 hours. The DMSA scan looks at the kidney structure. Primarily the bone scan is useful in assessing any condition affecting the skeleton. Patient must be fasting (NPO) for a least 4 hours. Imaging is begun with the injection. A series of images may be obtained at 2 hours, 4 hours and 24 hours. Patients booked for hepatobiliary studies with the question of biliary atresia or neonatal hepatitis do not need to be NPO.